We have a full vocabulary to describe our relationship to the body: we inhabit it, live inside it or with it, make friends with it or treat it as difficult, complicated. Everyone has their own verbs to describe their own particular negotiation with the nerves and bones and muscles that house their mind. As for me, I wear my body like an unruly suit. Sometimes it is just a surface artifact, and I am lying in bed floating in a sea of thought without considering my corporeality. Other times I am so filled with joy or rage or concentration that my physicality fades into the background like so much static, fuzzy on the edges and maybe a slight inconvenience. Occasionally, I hike a mountain or schlep a suitcase and I am all limbs, I am sweaty and in my own way and straining against every frustrating cell in my limited form. The relationship is not static, but it is always external—my mind preceded with form with staggering arrogance. If I am a glowing statue of perfection, it is because I decided it. If I am a sack of melting flesh, it’s because my stupid eyes in my stupid face have behind them a hyper-critical mind peering out the lens. When my body changes, this disconnect is particularly disorienting. My soul wants to cook, wants to eat my favorite food with abandon, stay up all night reading, and travel miles, miles, miles in search of some new adventure. When I was in college, my body developed Chronic Fatigue Syndrome, and for six months I tried to work a job while attending school full-time while my nonsense flesh tried to sleep eighteen hours each day, inflicting horrible stomach cramps upon my waking self. When that period passed with the eventual help of medication and what I can only assume was a slice of dumb luck, my body grew long and lean as I travelled the world for two years with a single suitcase. I forgot what it was like to wear a flawed suit, and I even ceased to crow with joy every day I stayed awake for hours at a time. A few years later, I developed chronic migraines and it took me almost a year to stop dismissing the issue as “just a headache,” even as I lost hours and days to lying in bed placating my muscles and blood vessels with hot pads and sleep. It felt like another betrayal. I gave up yoga, gave into cravings, and let myself float on the ebb and flow of mood. Again medication rescued me, but this time it changed more than my symptoms. My body became unruly in unrecognizable ways. My moods suddenly had physical resonance as my medication tied itself to my emotional health. And the medication caused my metabolism to shift, bringing my attention to my corporeal form in ways I had always dismissed, been impatient with in ways I hadn’t even considered. Where did this new shape come from, and how was I supposed to treat it? My body swelled in unfamiliar places, and whole sections of my wardrobe became untenable or unappealing. It wasn’t just about what was fashionable or flattering—those surface indicators of attention to the body. Fabrics that once resonated with me became absolutely intolerable. Pattern became genuinely unappealing in any of its forms. And I was left with a closet full of items that had carried me around the world, through a life I adored, and that no longer served me. How was I supposed to jettison the sweaters I inherited from my mother, ones she wore in college snapshots that made us look like twins? How could I say goodbye to the skirts she sewed for my first semester abroad, sari blouses my host mother had cut for me? What was I going to do with the gorgeous vintage I purchased wandering through the back streets of Prague, my most favorite city? Each item was as precious to me as a friendship, memories in every weave and stitch. But nothing fit, nothing was wearable to my present self, and I was left with a closet full of ghosts. I know better than to build a shrine to my former self, to keep a closet like a museum while living in leggings and random bits accumulated with little joy. But after years of treating my body like an afterthought, like a vessel or a vehicle, I had forgotten to dress for a new life, for new adventures. 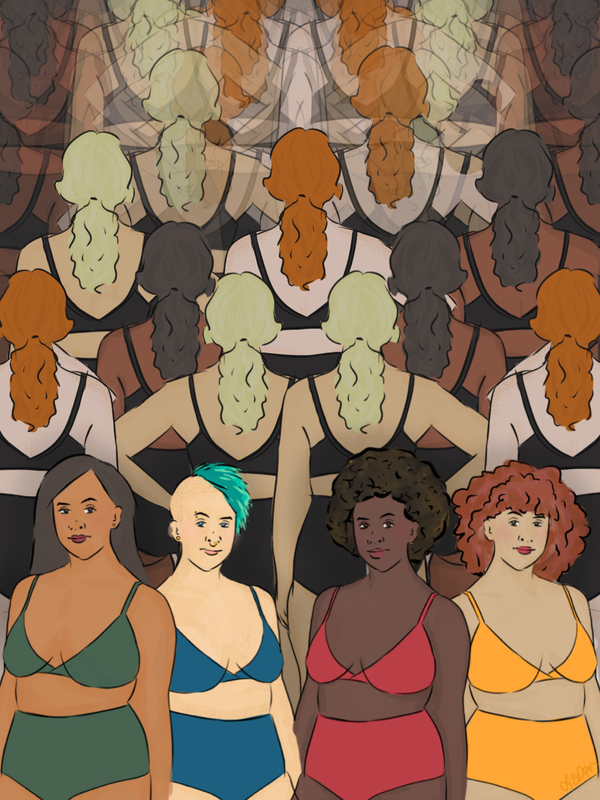 I started small, started invisible with lingerie that finally held me like an embrace. After that, I bought tall, dramatic shoes in classic shapes that made me feel reinvented. These elevated my jersey and stretch, but they did not feel like kin, not the way the accumulated wardrobe of my former body did. So I took to learning how to sew my own clothes to reinvent the relationship between my clothing and I. While it helped me see my shape more clearly, it didn’t have the power and polish and thoughtfulness that I felt inside my head, even as my skills improved. What it was missing was the connection to the outside world, the feeling of discovery that someone else had seen you as clearly as you see yourself. That feeling of being rendered visible not just to yourself, but to others who care about cut and fabric as much as you do. I’m still midwifing my new style needs into the world, in a learning process that is as much about educating myself in the language of my body as it is about making sure I look decent when I leave the house. I have yet to pinpoint the ways I can project my brain out into the world without opening my mouth. My body, and its own suit of clothes, has yet to catch up with the way I move, with the way I speak myself into the world. We’ll get there, mind and body both, eventually, one new memory at a time. We did it before; we will do it again. Haley is a freelance writer and illustrator. Splitting her time between the New England woods and New York City, she writes about the modern mystical, as well as art, fashion, and the natural world. Follow her on Instagram and Twitter at @hedhouseman.